The Indus Valley civilization, one of the oldest in the world and dating back at least 5,000 years, spread over much of what is presently Pakistan. During the second millennium B.C., remnants of this culture fused with the migrating Indo-Aryan peoples. The area underwent successive invasions in subsequent centuries from the Persians, Greeks, Scythians, Arabs (who brought Islam), Afghans, and Turks. The Mughal Empire flourished in the 16th and 17th centuries; the British came to dominate the region in the 18th century. The separation in 1947 of British India into the Muslim state of Pakistan (with West and East sections) and largely Hindu India was never satisfactorily resolved, and India and Pakistan fought two wars - in 1947-48 and 1965 - over the disputed Kashmir territory. A third war between these countries in 1971 - in which India capitalized on Islamabad's marginalization of Bengalis in Pakistani politics - resulted in East Pakistan becoming the separate nation of Bangladesh. In response to Indian nuclear weapons testing, Pakistan conducted its own tests in 1998. The dispute over the state of Kashmir is ongoing, but discussions and confidence-building measures have led to decreased tensions since 2002. 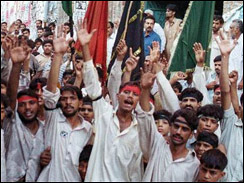 Mounting public dissatisfaction with President MUSHARRAF, coupled with the assassination of the prominent and popular political leader, Benazir BHUTTO, in late 2007, and MUSHARRAF's resignation in August 2008, led to the September presidential election of Asif ZARDARI, BHUTTO's widower. Pakistani government and military leaders are struggling to control Islamist militants, many of whom are located in the tribal areas adjacent to the border with Afghanistan. The November 2008 Mumbai attacks again inflamed Indo-Pakistan relations. The Pakistani Government is also faced with a deteriorating economy as foreign exchange reserves decline, the currency depreciates, and the current account deficit widens. 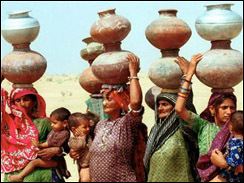 Pakistan, an impoverished and underdeveloped country, has suffered from decades of internal political disputes, low levels of foreign investment, and declining exports of manufactures. Faced with untenable budgetary deficits, high inflation, and hemorrhaging foreign exchange reserves, the government agreed to an International Monetary Fund Standby Arrangement in November 2008. Between 2004-07, GDP growth in the 6-8% range was spurred by gains in the industrial and service sectors, despite severe electricity shortfalls. Poverty levels decreased by 10% since 2001, and Islamabad steadily raised development spending in recent years. In 2008 the fiscal deficit - a result of chronically low tax collection and increased spending - exceeded Islamabad's target of 4% of GDP. Inflation remains the top concern among the public, jumping from 7.7% in 2007 to 24.4% in 2008, primarily because of rising world fuel and commodity prices. In addition, the Pakistani rupee has depreciated significantly as a result of political and economic instability. A car bomb tore through a crowded market in northwestern Pakistan. A suicide car bomber struck buildings housing police and intelligence agency offices in eastern Pakistan.